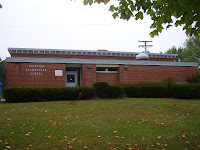 Fairview Elementary was built in 1937-38. 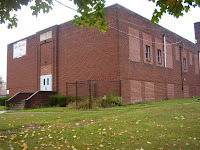 It started out as a Yellow Creek Township School, but joined the Wellsville School District in 1959. In Sept of 1968, Charles Wilfing became it's esteemed principle. So far, from what I have heard, he was very stern and insisted on following the rules. He died in Nov of 1979, while still the principle. Rumors abound about his ghost still walking the halls of both the old building (the taller of the two) and the new one (built around 1973). 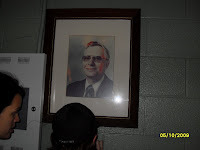 When the building was still a school, Mr. Wilfing's portrait that graced the wall in his memory, would fall to the floor on a regular basis. Also, radios in the administration office would turn on by themselves. There are not a lot of stories connected to this building so far. But wow, is it creepy in there. We are still sifting through the data, but so far it is looking like something walks the halls of these schools. Whether the haunting is residual or intelligent is yet to be determined. But the question remains- Who is it that haunts this school? According to Amy, there may be more than one. I am looking for any stories out there that may be connected to the history of these buildings. Did you have an experience when you went there as a child? Please email me and let me know. The current owner, Nick DaLonzo, and his family have had several experiences inside the buildings. We have already been there once and look forward to at least two more sessions in the buildings. Nick and his family bravely journey with us into these seemingly haunted halls to look for ghosts and answers. Our first adventure was Oct 5 and included Nick, Mindy, Nick, Travis, and Ricky. It was a great night which is the subject of my next story.